In the world of homeopathy, many remedies follow the principle, “like cures like.” Homeopathic stramonium is one of them. This principle is where the substance could have harmful effects under certain circumstances, but when highly diluted and made into a homeopathic remedy, it is very effective, safe, and contains virtually no traces of the original substance. Homeopathic stramonium comes from the thorn apple, which contains poisonous alkaloids. In high dosages, these alkaloids cause hallucinations, sedation, and can even be deadly. But, as a homeopathic remedy, stramonium can effectively treat many health conditions, including mental illness, respiratory disorders, ADHD (attention deficit hyperactivity), alcoholism, chorea, fever, and as part of a vaccination or drug detoxification. Use this article as a comprehensive guide for everything about homeopathic thorn apple, including its history, homeopathic profile, and its various health benefits and uses. Thorn apple (Datura stramonium) is thought to be native to western Asia and South America, but now it grows in many temperate areas, and often on a wasteland. The plant is part of the Solanaceae, or nightshade family. 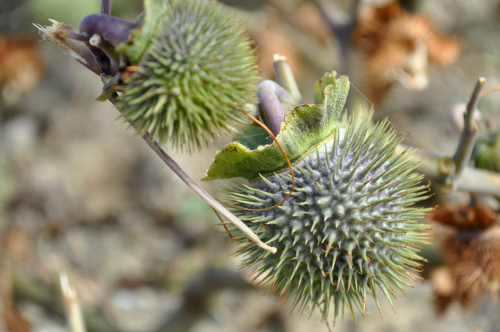 Other common names of thorn apple include devil’s apple, jimsonweed, Jamestown weed, stinkweed, false castor oil, pricklyburr, devil’s cucumber, tolguacha, devil’s trumpet, hell’s bells, and devil’s snare. The thorn apple plant is a strong narcotic, and in medicine, it has been used as a painkiller for neuralgia, sciatica, and rheumatism. It also relaxes the bronchial tube muscles and urinary and digestive tracts, while also reducing mucus secretions. In the medieval period, folk healers used thorn apple in ointments, whereas Native Americans used it during shamanistic rituals. In 16th century Europe, soldiers would eat them to dull their emotions before battle. It was also used as an anti-inflammatory and convulsion treatment. Homeopathy founder Dr. Samuel Hahnemann had proven the efficacy of homeopathic stramonium and published his findings in his Materia Medica Pura between 1821 and 1834. Homeopathic stramonium is made from thorn apple’s fresh leaves and flowers, or the seeds, which are then chopped and macerated in alcohol, before being filtered, diluted, and succussed to create the remedy. Stramonium is a key homeopathic remedy used for a variety of mental and psychological disorders, such as violence, mania, manic depression, anxiety, and schizophrenia. The remedy is often prescribed for excitability with disorientation, confusion, and a fear of the dark. There is also squirming, chattiness, and incoherent muttering. Imaginary voices, visions, and hallucinations are also common. The remedy is used for anxiety after the effects of a deep shock like a disaster or from seeing death. This makes stramonium a good remedy for those in professions that deal with emergency medical services. Symptoms improve from warmth, light, and amongst company, but symptoms may worsen from darkness, touch, and while looking at shiny, reflective objects. Symptoms may also be triggered from a traumatic childbirth, drug addiction or alcoholism, or from more serious conditions like schizophrenia. Alcohol withdrawal can also lead to hallucinations, convulsions, depression, and anger. An Indian pilot study from Kerala, India, found that stramonium is among the homeopathic remedies prescribed for treating alcoholism. The conclusion of the study determined that 67.5% of the participants were considered “cured” from homeopathy. Another study published in the Indian Journal of Research in Homeopathy in 2016 found that stramonium was among the most useful remedies used during relapse of schizophrenia. In homeopathy, the remedy profile is significant for determining whether homeopathic stramonium is the right remedy for your symptoms. People that respond best to stramonium may experience violence and rage, and particularly sudden outbursts along with strong fears. The anger may be rooted in a person’s profound fear, following an accident or abuse. The person’s fear may also take the form of fear of water or the dark, and may also develop hyperactivity or overt sexuality. They may also be prone to stammering and may have religious delusions while praying and preaching relentlessly. Sleep may also trigger symptoms. The remedy is often prescribed for fevers and chest problems accompanied by terrors and rages. It is also used for convulsions, epilepsy, Parkinson’s disease, tics, delirium, and other nervous system disorders. Stramonium is also a key remedy for chorea. Let’s look at these key health benefits of stramonium in a little more depth. Stramonium is often considered for respiratory illnesses, especially asthma or bronchitis. In the case of asthma, the person may experience tightness in the chest, breathlessness, or a dry, wheezing cough. Asthma attacks will occur either during or after fits of intense fear or rage. With bronchitis conditions, stramonium is used when there is wheezing associated with shortness of breath or a cough that produces green or yellow phlegm. Strong anger or fear may also trigger the person’s bronchitis symptoms. Stramonium is a common homeopathic remedy used for ADHD or general hyperactivity. The remedy is prescribed when the person feels under attack or afraid of animals, or of being alone or abandoned. The person may also be withdrawn, timid, and shy in front of strangers. Constant talking, singing, and sudden laughter or shrill cries are also common characteristics of the person requiring stramonium. Chorea is an abnormal involuntary movement disorder belonging to a group of neurological disorders called dyskinesias. Stramonium is prescribed for involuntary, jerky twitches of the limbs, face, or trunk. There is often also stuttering. Symptoms may be caused by extreme fright, meningitis, a head injury, or a bad reaction to a vaccine. In extreme cases, there may also be epilepsy, convulsions, and facial grimacing. Homeopaths may prescribe stramonium for a high fever with a burning thirst. On top of that, there may also be night terrors, hallucinations, delirium, fear of the dark, and febrile convulsions. The person’s limbs may also twitch involuntarily, and there may be chaos surrounding their heart and pulse. Symptoms will likely worsen from sleep, cloudy weather, being left alone, and from swallowing. Stramonium can also be added to a detoxification program of vaccines or psychedelic drugs, like cannabis or LSD (lysergic acid diethylamide). Stramonium is also considered when meningitis, encephalitis, delirium, tics, convulsions, or neurological disorders result after a vaccination. It is also used when ADD (attention deficit disorder) or hyperactivity occur after taking a vaccine. Where can you find homeopathic stramonium? It can be purchased either online or from the supplement section of a health food store. Homeopathic remedies can be found in liquid or pellet form. You will also be able to get stramonium as part of your visit with a homeopath when they have determined the remedy best matches your mental, emotional, and physical symptom picture. As mentioned in this article, the key uses of stramonium include being a treatment for various mental illnesses, such as anxiety or schizophrenia. It is also used for alcoholism, respiratory disorders, ADHD, chorea, fever, or as part of a drug or vaccination detox. How do you know where stramonium is right for you? It is a good idea to consult with a qualified homeopath before taking stramonium, or any homeopathic remedy, rather than treating your own symptoms. Your homeopath will be able to recommend the best dosage and potency for you. Follow-up appointments with your homeopath will then reveal whether you need to change your potency, dosage, or remedy. Lockie, A., Encyclopedia of Homeopathy: The Definitive Home Reference Guide to Homeopathic Remedies and Treatments for Common Ailments (New York: DK Publishing, Inc., 2000), 53, 189, 211. Lockie, A., et al., The Complete Guide to Homeopathy: The Principles & Practice of Treatment (New York: DK Publishing, 1995), 126-127. Hershoff, A., N.D., Homeopathic Remedies: A Quick and Easy Guide to Common Disorders and Their Homeopathic Treatments (New York: Penguin Putnam Inc., 1999), 93, 100-101, 146, 279. “Stramonium,” Home Remedy Central; http://www.homeremedycentral.com/en/homeopathic-remedies/homeopathy/stramonium.html, last accessed August 30, 2017. “Stramonium,” Herbs2000; http://www.herbs2000.com/homeopathy/stramonium.htm, last accessed August 30, 2017. Oberai, P., et al., “Homeopathic management of Schizophrenia: A prospective, non-comparative label observational study,” Indian Journal of Research in Homeopathy, June 10, 2016; 10(2): 108-118; http://www.ijrh.org/article.asp?issn=0974-7168;year=2016;volume=10;issue=2;spage=108;epage=118;aulast=Oberai. Soni, P., et al., “Pharmacological properties of Datura stramonium L. as a potential medicinal tree: An overview,” Asian Pacific Journal of Tropical Biomedicine, December 2012; 2(12): 1002-1008. DOI: 10.1016/S2221-1691(13)60014-3. Brule, D., et al., “An Open-Label Pilot study of Homeopathic Treatment of Attention Deficit Hyperactivity Disorder in Children and Youth,” Complementary Medicine Research, 2014; 21: 302-309. DOI: 10.1159/000368137. “Alcoholism reduced by homeopathy,” Homeopathy Plus; http://homeopathyplus.com/alcoholism-reduced-by-homeopathy/, last accessed August 30, 2017. “A pilot Study of effectiveness of Homoeopathic Treatment in Management of Alcoholism,” Homeobook; http://homeobook.com/pdf/alcohol-homeopathy.pdf, last accessed August 30, 2017.